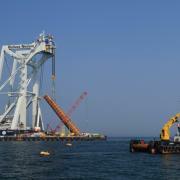 Van der Venne Lifting can help you with Offshore lifting – load out – site supervisor. Responsible for all the preparations of heavy lifts . Supervise a team of crane operators and /or riggers during lifting operations. Monitor work method statements ,risk assessments , weather conditions , lifting equipment. Please feel free to contact us if you need offshore lifting or site supervisors.